Rock in a hard place: why are Iran and Afghanistan jailing metal bands? An appeals court in Iran recently upheld the jail sentences of three men charged with “spreading propaganda against the system.” The case of filmmaker Hossein Rajabian (31), his brother Mehdi Rajabian (26) and Yousef Emadi (35), both of whom are musicians, sparked an outcry among various human rights groups. Amnesty International promptly called on artists all over the world to rally against the Iranian authorities, in the hope of quashing what they allege are torture-induced convictions. Depending on where you live, playing heavy metal can be a dangerous business. Consider the fate of Nikan Siyanor Khosravi and Khosravi Arash ‘Chemical’ Ilkhani. As members of Iranian metal band Confess, both men were arrested last November and hit with various charges, including blasphemy, writing anti-religious lyrics and promoting music that the state considers to be Satanic in nature. The latest Confess album, In Pursuit of Dreams, features songs with provocative titles like Teh-Hell-Ran and New World Order. It’s believed that the pair could now face up to six years in jail. Thankfully though, and contrary to initial reports, they are not facing execution charges. More recently, an appeals court in Iran upheld the jail sentences of three men charged with “spreading propaganda against the system.” The case of filmmaker Hossein Rajabian (31), his brother Mehdi Rajabian (26) and Yousef Emadi (35), both of whom are musicians, sparked an outcry among human rights groups. Amnesty International promptly called on artists all over the world to rally against the Iranian authorities, in the hope of quashing what they allege are torture-induced convictions. All three men are co-owners of BargMusic, founded in 2009 as an online producer and distributor of Iranian music, from both local artists and exiles abroad. According to iranhumanrights.org, the presiding judge in Tehran described the label as an agent of “social corruption”, denouncing Mehdi Rajabian for promoting illegal music, including songs by female singers. He also accused the three defendants of being in contact with “political and anti-revolutionary” singers outside of Iran. Hossein Rajabian’s chief ‘crime’, meanwhile, was to make a documentary, Inverted Triangle, about Iranian women’s rights to divorce. The men were each fined £4,000 and now face three years in prison. Amnesty International claims that, following their arrest, the accused spent two months in solitary confinement at a notorious section of Tehran’s Evin prison, run by the Revolutionary Guards. There they were subjected to beatings and electric shocks, before being forced to make video ‘confessions’. Amnesty adds that, at no point at all - from arrest and detention through to trial and appeal - were they allowed any kind of legal representation. “Apart from demonstrating the authorities’ utter contempt for freedom of expression, the appalling treatment of these men shows how far removed the notion of justice is from Iran’s criminal justice system, which is steeped in torture and violations of due process,” stated Said Boumedouha, deputy director of Amnesty International’s Middle East and North Africa programme. There are now a number of Iranian expatriate musicians who are lending their weight to putting an end to this tyranny. Along with her sister Safoura, Melody Safavi is co-founder of international ska band, Abjeez. The siblings fled Iran with their parents in 1987 (during the Iran-Iraq War) and settled in Sweden, though Melody is now based in the U.S. Abjeez deal in infectiously uptempo songs with drily subversive lyrics, mostly delivered in their native Farsi language, that address the situation in Iran. For them, BargMusic was a vital outlet. Abjeez was formed the same year that Mahmoud Ahmadinejad, a conservative hardliner, took over. “As soon as we released our first album, our music and videos went viral and we started touring around Europe, Canada and North America,” says Melody. “We have never had the pleasure of performing live in Iran, as our music is still considered illegal there. At the same time, we felt the need for a female-led Persian band outside Iran who could introduce and represent aspects of Iranian culture that were overshadowed by the negative political controversies. Iran has been tightening the screw on artistic freedoms since the presidential poll of 2009, when Ahmadinejad was re-elected amid allegations of fraud and vote-rigging. 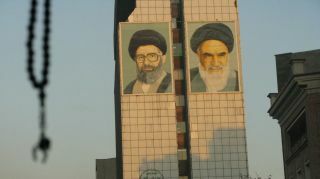 The resulting protests lasted for over seven months, with over 4,000 arrests and opposition leaders claiming that the Revolutionary Guards tortured and abused many dissenters. The final death toll was estimated at over 150, though the authorities’ official figure was 36. The following year, the country’s supreme leader, Ayatollah Ali Khamenei, announced that “promoting and teaching” music was no longer “compatible with the highest values of the sacred regime of the Islamic Republic.” The Education Ministry banned musical education in private schools. Even state-sanctioned musical events weren’t safe. In August 2013, for example, Tehran authorities arrested more than 200 fans during a gig by Iranian groove-metal outfit, Dawn Of Rage. Much to the dismay of the organisers, who’d already been granted a permit by the Ministry of Culture and Islamic Guidance. All those arrested were released after a brief period of detention. Someone with firsthand experience of this is Travis Beard, an Australian photojournalist who has been roaming the globe for two decades. He visited Afghan refugee camps for the first time in 2001, eventually moving into video-journalism and setting up Combat Communications as an umbrella group for artists in Afghanistan. Beard also organised Sound Central, the inaugural rock festival in Afghanistan, in 2011. This was, he explains, an entirely new concept in a deeply conservative country where live music had previously been outlawed under the Taliban. Beard is keen to point out that the majority of opposition to rock music came not from the authorities, but from staunchly traditional elements in orthodox Afghan society. Nevertheless, he was able to make Sound Central an annual event, at least for another two years. He also became heavily involved with a local metal band, District Unknown, and began promoting their music. Beard’s 2014 documentary, Martyrs Of Metal, was an absorbing study of the metal scene in Kabul, with District Unknown as its primary focus. In June last year, both band and Beard won the Global Metal gong at the Metal Hammer Golden Gods Awards in London. An Iranian musician and poet who fled his homeland for Germany in 2005, Shahin Najafi had been sentenced to three years in prison and 100 lashes. The satirical nature of his lyrics resurfaced in 2012, when Islamic clerics took offence at his song Naghi, which they said showed disrespect to Shia doctrine. The issue took on a whole other level in May last year, when ultra-conservative Iranian website Aba Shohada offered a reward of over £100,000 for anyone who blows up Najafi’s live venues. The website also threatened reprisals against Najafi’s fans and concert promoters. Luaty Beirão (Angola) Angolan-Portuguese hip-hop artist Luaty Beirão was sentenced to five-and-a-half years in prison in March 2016, for “rebellion against the president of the republic, criminal association and falsifying documents”. 16 other activists were given prison terms of between two and eight years. They’d been arrested last June during a book club meeting, where they’d discussed a publication about non-violent resistance. Nine Tibetan musicians have been given jail sentences over the past four years, mostly without official explanation for their convictions. Lolo, Shawo Tashi, Pema Tinley, Chakdor and Choksal were imprisoned for between one and six years in January 2014, following on from the detention of Trinley Tsekar, Achok Phulshung, Kalsang Yarphel and Gongpo Tsezin. With the exception of Tsekar, who has been jailed for nine years for his part in protests, none of the men’s alleged crimes have ever been disclosed to the public. Moroccan authorities continue to ban hip-hop musician Mouad ‘El Haqed’ Belghouat from performing in his home country. The rapper came to prominence during the Arab Spring, when his songs about poverty, corruption and oppression chimed with the air of revolution. Detained in 2011, he served two years in prison before being arrested twice more on his release. When he returned to play Casablanca last summer, Moroccan authorities blocked off roads and turned off the electricity supply to ensure that the gig didn’t go ahead. For more information, visit the Amnesty International website.